Investigate the world of textiles and see how they are made and decorated. See Marie Antoinette's court gown, made in the fashionable style of the 1780s. Compare dresses from the 1920s and 1960s. Watch a video montage of fashions from the 1950s. 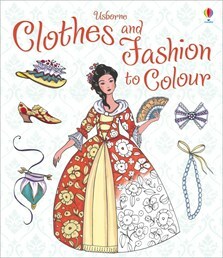 Filled with gorgeous gowns, fabulous frocks and stylish accessories to colour, this sophisticated colouring book provides a wonderful introduction to the history of fashion. Full of stylish line drawings of beautiful clothes and costumes, from Medieval headdresses and Elizabethan ruffs, through to the fashions of the roaring 20s and swinging 60s. Includes lovely watercolour examples, as well as suggested colour palettes and fascinating facts about the outfits featured and the type of people who would have worn them. Perfect for fashion-lovers of all ages.